Racecar driver Alex Tagliani finished ahead of points leader LP Dumoulin at the conclusion of the 100 lap (170.27-km) inaugural Visit New Hampshire 100 held Saturday afternoon at the New Hampshire Motor Speedway 1.703 km paved asphalt oval in New England. Kevin Lacroix dominated the 12th and penultimate round of the 2018 NASCAR Pinty's schedule to score his first win since June. With his seventh-place finish, Tagliani shaved one point off the gap and is now a scant four points behind championship leader LP Dumoulin. Next weekend's championship showdown in the season finale at Jukasa Motor Speedway located near Hamilton, Ontario promises to be a hot one. Starting fourth today, Tagliani stayed in the top five during the first third of the race. Following a pit stop in the race's only full course caution on lap 45, the Canadian driver stopped to fix a technical problem on his Chevrolet Camaro EpiPen/RONA/St Hubert/ Spectra Premium and lost several positions. When he returned to the track, Tag was listed in 13th place while his main opponent in the championship race was fifth. Back in form, Tagliani moved up the field and finally overtook Dumoulin on lap 60. But the fight was not over as Dumoulin tried several times to move past Tag during the next forty laps, but to no avail. He finished right behind Tag. 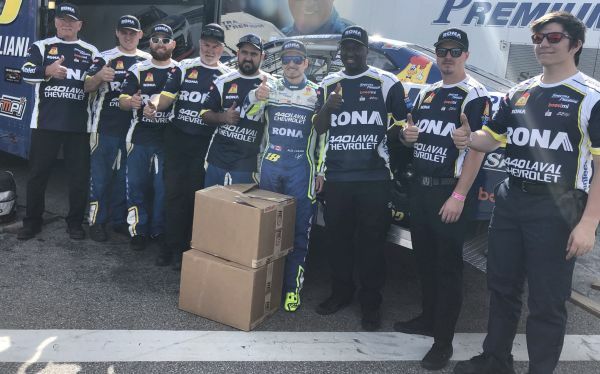 "Obviously, this seventh-place finish is not what we expected with the car we had in practice and qualifying," said Alex Tagliani. "I am quite disappointed with the results, but we did shave one point off the gap to the championship leader, which makes it up a bit. A technical glitch changed the outcome of our race as the car started to oversteer in the worse way, making it hard for me to drive it. After pitting to repair, we lost ground on the leaders when we returned to the track and could not make our way back to the front. Still, we are not giving up. We are highly motivated to end the season on a high note. We are heading to a track that I like for a championship showdown. I feel quite confident for the season finale. Maybe this is our time to finally finish on top." Race winner Lacroix crossed the finish line more than five seconds ahead of Peter Shepherd, and eight ahead of Donald Theetge. Cole Powell and D J Kennington round up the to five. Seventeen drivers started the race with 15 crossing the finish line. Nine cars finished on the lead lap. The race was under full course caution once for a total of three laps. This was Tagliani's tenth top-seven finish in 12 starts this year. Tag has a pair of wins and one pole position this year. In 70 NASCAR Pinty's Series career starts, Tagliani has eight wins, 30 top-fives and 48 top-ten finishes. The Visit New Hampshire 100, round 12 of the NASCAR Pinty's Series, will air on TSN on Sunday, September 30 at 12:30 p.m. ET. In the driver's championship, Tagliani remains in second place with 484 points, only four behind leader LP Dumoulin. Next week's season finale at Jukasa Motor Speedway will crown this year's NASCAR Pinty's Series driver champion. The NASCAR Pinty's Series returns to Ontario next week for the season finale at Jukasa Motor Speedway one kilometre oval track located near Hamilton. The Pinty's Fall Brawl, scheduled to run Saturday, September 29 at 7:30 p.m., will conclude a thirteen-race season that will crown the 2018 NASCAR Pinty's Series Champion.